“Shankar is a genius in visual effects and in directing actors. Whenever I work with creative directors my movies are successful. It doesn’t matter if it’s an Indian movie, a German movie or an American movie. The key thing is, when it is a good creative director who has a great vision, the film is successful and director Shankar has it,” he added. 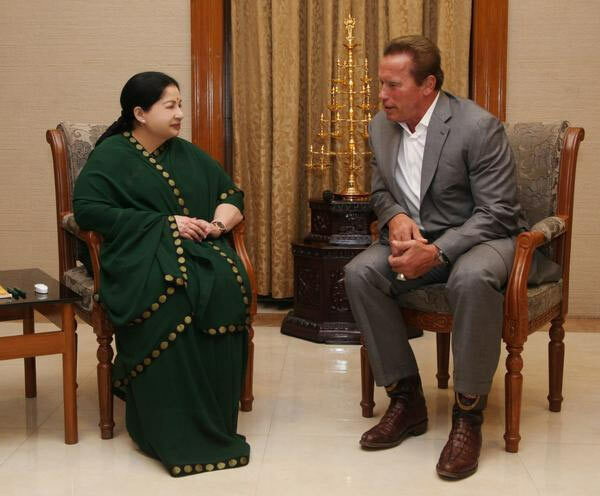 Arnold arrived with his entourage amidst tight security on Monday morning at the Chennai airport to attend the audio launch of Vikram-starrer “I”. The audio launch took place on Monday evening at the Jawaharlal Nehru Indoor Stadium, where the 67-year-old actor shared the dais with Tamil movie superstar Rajinikanth mean while he also had a meeting with the Tamil Nadu CM J.Jayalalitha in the afternoon on the same day. The first official teaser of “I” starring Vikram, Amy Jackson, Suresh Gopi and Upen Patel in the lead roles, was released on the same day. Vikram plays multiple roles in the film including that of a werewolf and a hunchback. The soundtrack of the film is scored by A R Rahman. The movie is expected to hit screens during Diwali festive season.